Canine influenza(CI), or dog flu, is a highly contagious viral infection affecting dogs and occasionally cats. There is no indication the CI can be transmitted from dogs to humans or vice versa. At present two strains of canine influenza virus have been identified in the United States, H3N2 and H3N8. Canine H3N8 was first identified in Florida in 2004 in racing greyhounds. Since first detected, canine H3N8 has been identified in dogs in most states, but has not been the source of many recent infections. The second more active strain, canine H3N2, was first identified in the United States in March 2015 following an outbreak of respiratory illness in dogs in the Chicago area. Following the initial diagnosis in Chicago additional cases were reported in a number of states. In early 2016, a group of shelter cats in Indiana were diagnosed with H3N2 canine influenza. In 2017 CI(H3N2) was diagnosed in dogs in Florida, Georgia, North Carolina, South Carolina, Texas, Kentucky, Tennessee, Missouri, Louisiana, and Illinois. Neighboring states Michigan and Kentucky had significant outbreaks in 2018. CI is transmitted through droplets or aerosols containing respiratory secretions from coughing, barking, and sneezing. Dogs in contact with infected dogs at places such as groomers, kennels, day care facilities, dog parks, and shelters are at increased risk of infection. Also CI can spread indirectly through people that have been in contact with an infected dog or through objects (food and water bowls, leashes, collars, kennels). The virus can remain viable on surfaces for up to 48 hours, on clothing 24 hours, and on hands for 12 hours. Virtually all dogs exposed to CI become infected with approximately 80% developing clinical signs. The approximately 20% of infected dogs that do not show clinical signs can still shed the virus and spread the infection. Similar to people with influenza, CI causes an acute respiratory infection in dogs. There is no “season” for CI and infections occur any time of year. The virus resembles canine infectious tracheobronchitis (known as “kennel cough”) which is caused by a couple of bacteria and numerous viruses. The most common clinical sign of CI is a persistent cough that lasts for 10 to 21 days despite treatment with antibiotics and cough suppressants. Nasal and ocular discharge, sneezing, lethargy, anorexia, and a fever may also be present. Some dogs are more severely affected and exhibit clinical signs of pneumonia such as a high fever and increased respiratory rate and effort. Although most dogs recover from CI, the mortality rate is as high as 10%. To date, no deaths in cats infected with CI have been reported. 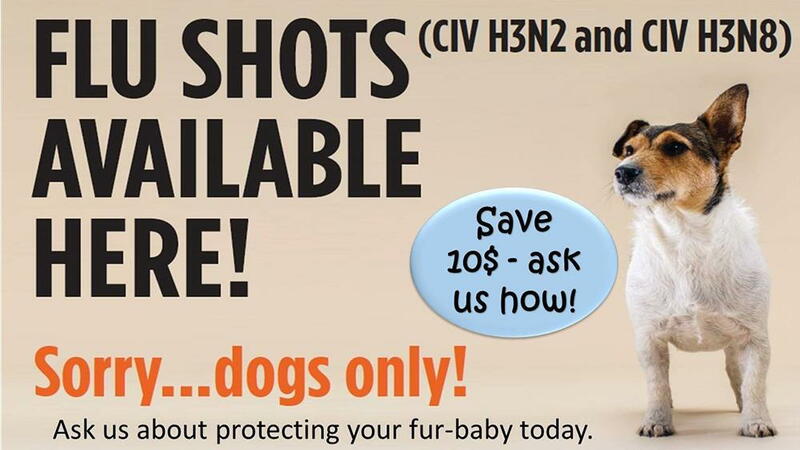 There is a canine “bivalent” vaccine offering protection against both strains of CI. At this time there are no CI vaccines approved for use in cats. Vaccination may not always prevent infection, however it does reduce the severity and duration of clinical signs. Currently our doctors highly recommend the CI vaccine for dogs that will be going places where there will be other dogs such as boarding, grooming, and day care facilities as well as dog parks. Any exposure to other dogs or an environment where other dogs have been increases risk of infection. 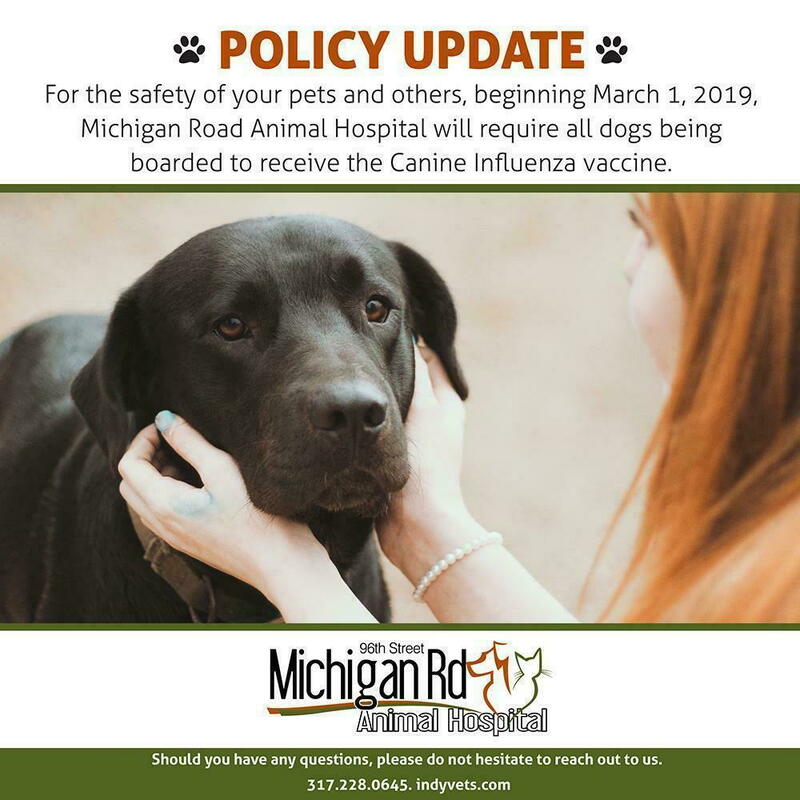 Most boarding facilities in our area are now requiring CI vaccination and we will be requiring CI vaccination for dogs boarding at our facility starting March 1, 2019. Vaccination requires two doses three weeks apart and then yearly vaccination thereafter. If you have questions or concerns regarding your pet we would be happy to discuss them with you. Call us today at 317-228-0645.